The small intestine is a tubular organ that extends from the pyloric sphincter, at the end of the stomach, to the beginning of the large intestine (ileocecal valve). With its many loops and coils, it fills much of the abdominal cavity. It may be 18-20 feet long depending on the size of a person.The small intestine receives secretions from the pancreas and liver (gallbladder), and it completes digestion of the nutrients in the chyme, received from the stomach. It is responsible for absorbing or assimilating the products of digestion and sending the rest of the chyme to the large intestine. The small intestine should be considered the primary digestive and assimilation organ. The duodenum is the first part of the small intestine. It is more stable than the rest of the small intestine, which is made up of the jejunum and ileum. The mesentery is a double-layered fold of peritoneum that contains the blood vessels, nerves and lymphatic vessels that supply the intestinal wall. 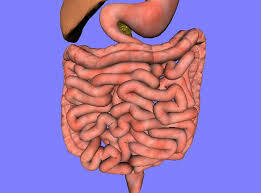 As stated, the small intestine receives its food mixture, commonly referred to as chyme, from the stomach. Chyme is very acidic when it comes from the stomach because of the pepsin content. The enzymes from the pancreas help to alkalize it, which is important because the small intestine is an alkaline organ and too much acid will decompose the mucous walls and create ulcers. The small intestine receives the enzymes from the pancreas through an opening in the duodenum, the hepatopancreatic sphincter. This sphincter remains closed unless the small intestine releases cholesystokinin into the blood. This hormone triggers the sphincter to open long enough for a squirt of bile to be released. The inside of the small intestine looks like velvet because there are innumerable amounts of mucous membranes that contain epithelial cells with microvilli. These microvilli have digestive enzymes embedded in them, including peptidase, sucrase, maltase, lactase and intestinal lipase. These villi and microvilli along with lacteal (lymphatic capillaries) absorb nutrients and place them directly into the blood stream where they are transported to the liver for inspection via the portal vein. The small intestine contains goblet cells which release mucus to protect the walls of the intestine against the acid pepsin that came from the stomach and Brunner’s glands which secrete a watery substance to “float” nutrients to the villi for absorption. Nerve fibers in the intestine monitor the environment and initiate hormone release if needed. These include enterokinase, released to activate trypsin from the pancreas and cholysistokinin, released to trigger opening of the hepatopancreatic sphincter (allowing a squirt of bile in the presence of fat or protein). Secretin and nuclease are released to help alkalize the acid contents. Epithelial cells are replaced every three to six days, meaning they are shed and new ones take their place. This is called cellular turnover. NOTE 1: When the body is unable to digest lactose, the sugar in milk, osmotic pressure occurs in the intestine, drawing water into the intestine. At the same time, intestinal bacteria feed from the undigested sugar, producing acids and gas. This is why lactose intolerance produces bloating, intestinal cramps and diarrhea. If you have bloating after eating any food, you have a similar issue. It may not be a milk issue, but all foods require certain enzymes, and a bloating reaction simply means you do not have a needed digestive enzyme. NOTE 2: Malabsorption is a term used when the intestine has the ability to digest, but cannot absorb the nutrients. Ciliac disease is a reaction to gluten when the microvilli become too damaged to absorb. Surgery and removal of lymphatic tissue can cause this as can removal of part of the small intestine (always a mistake). Don’t drink more than 4 oz. with meals. Heed the rules of food combining because your intestine is too acid. Make sure there are enough enzymes in the body. You may need to supplement some good bitter herbs and/or enzymes with your meal. This entry was posted in Diet/Lifestyle Basics. Bookmark the permalink. Milk Is One Of The Most DANGEROUS Proteins! Milk! It Does a Body Good? Why Be Your Own Doctor?